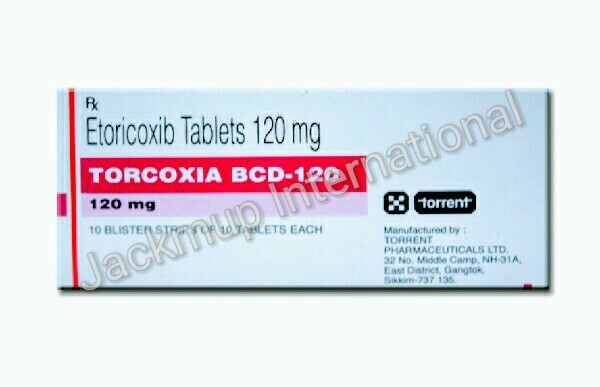 Description:- Torcoxia bcd tablet is used in osteoarthritis, rheumatoid arthritis, ankylosing spondylitis, gout, arthralgia, myalgia, pain during menstruation and post operative pain.It blocks the release of certain chemical messengers that are responsible for pain and inflammation (redness and swelling). Do not take etoricoxib, if you are allergic to etoricoxib or COx-2 inhibitors Consult your doctor before taking etoricoxib. If you had have a history of stomach ulcers and bleeding.If you are above 65 years of age. If you are have diabetes or high cholesterol or you smoke. Women who are pregnant or breast feeding should consult the doctor before taking this medication. Side Effects:- Abdominal pain, Palpitations, Nausea, Vomiting, Headache, Heartburn, Gastritis, Dizziness, Constipation, Edema, Diarrhoea, Dyspepsia, Increased blood pressure, Flatulence.